Failure to follow these directions or to park in a designated area may result in your vehicle being towed by the owner of the property on which you park. All Parking Lots will open 3 hours prior to game time and close 2-hours following the game (cars will be towed to the Red Lot if they are still in parking lots past closing time). Trailers, campers, buses, RV’s or any vehicle deemed too large to occupy a single parking space, will not be permitted to park in the Orange Lots. As you enter off of State Avenue and 110th, a parking associate will direct you to a lot that will accommodate the size of your vehicle. Tailgating in all General Admission lots is encouraged; however, your vehicle can only occupy one parking space. A free shuttle service begins running 2 hours prior to game time and will conclude 1 hour following the game. The shuttle service is offered for the Orange, White, and Hollywood Casino Lots with pick up occurring in the Orange Lot and at Hollywood Casino's main entrance. These lots are the farthest from Children’s Mercy Park and located within these lots are signs designating the pickup/drop off location. Shuttles that pick up in the Orange Lot/Hollywood Casino will drop off on France Family Drive. Entry into Children’s Mercy Park can be accessed through the Toyota or East Gate Entrance. At the conclusion of the game, the drop off location now becomes the pick-up location. ORANGE LOT: Available for free for all non STMs (Season Ticket Members) that don't have a parking pass. HOLLYWOOD CASINO AT THE SPEEDWAY: Complimentary parking available to everyone. Shuttle service is available to and from the stadium. GREEN LOT 1: Available to UMB Field Club STMs and Suite Ticket purchasers. GREEN LOT 2: Available to purchase via SeatGeek. Open to anyone. BLUE LOT 1: Available to Ameritas Shield Club STMs and Premium Terrace Table STMs. **No single game parking available for purchase. BLUE LOT 2: Available to STMs that purchased for the year. **No single game parking available for purchase. CAB LOT: Complimentary for all STMs and for use by the general public. From I-435 N & S: Proceed to I-70 and exit at 110th St. Turn right onto 110th St and continue straight through the light at Village West Parkway. Take a right on State Ave, when you arrive at Phoenix Dr. take a right. Once on Phoenix Dr. follow the direction of signage and parking personnel. From K-7: Proceed to I-70 and exit at 110th St. Turn right onto 110th St and continue straight through the light at Village West Parkway. Take a right on State Ave, when you arrive at Phoenix Dr. take a right. Once on Phoenix Dr. follow the direction of signage and parking personnel. From West: Approach from State Ave. Take a right at Phoenix Dr. and follow the signs and parking personnel to your lot. From I-435: Exit at State Ave East and proceed East. Take a left on 98th St and continue until you reach France Family Dr. Take a left on France Family Dr. At Cabela’s, take a left and then an immediate right into the lot as instructed by parking personnel. From I-435 and I-70: Proceed to I-70 and exit at 110th St. Turn right onto 110th St followed by another right at the light on Village West Parkway. Follow past Hollywood Casino to Homestead-Miami, take a left on Homestead-Miami. Follow the direction of signage and parking personnel to the entrance of Blue 2. From I-435 and I-70: Proceed to I-70 and exit at 110th St. Turn right onto 110th St followed by another right at the light on Village West Parkway. Follow past Hollywood Casino to Homestead-Miami, take a left on Homestead-Miami. Follow the direction of signage and parking personnel to the entrance of Blue 1. From I-70: Exit on to I-435N and then follow the instructions below. From I-435N/S: Exit at Parallel Pkwy East. Proceed east to 98th Street. Take a right on 98th Street and another right on France Family Drive. At Nebraska Furniture Mart, take a right and then a left as instructed by parking personnel. From I-435 N & S: Proceed to I-70 and exit at 110th St. Turn right onto 110th St and continue straight through the light at Village West Parkway. Take a right on State Ave, when you arrive at 110th St take a left. Once on 110th St turn right on Stadium Dr. and follow the direction of signage and parking personnel. From K-7: Proceed to I-70 and exit at 110th St. Turn right onto 110th St and continue straight through the light at Village West Parkway. Take a right on State Ave, when you arrive at 110th St take a left. Once on 110th St turn right on Stadium Dr. and follow the direction of signage and parking personnel. From West: Approach from State Ave, when you arrive at 110th St take a left. Once on 110th St turn right on Stadium Dr. and follow the direction of signage and parking personnel. 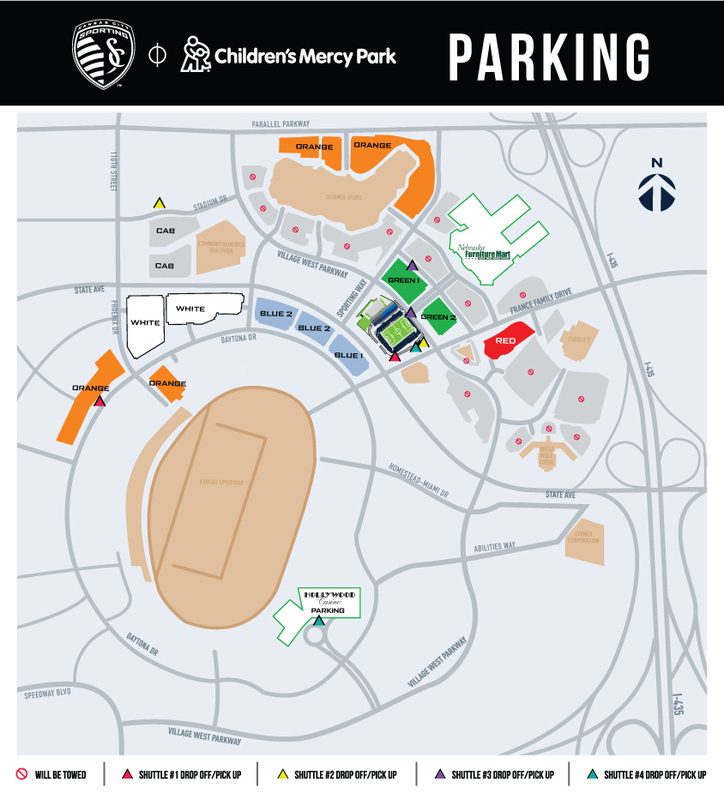 Parking at Children's Mercy Park is always free, but if you are interested in upgrading to the closest single-match parking possible, passes are available in the Green 2 Lot for $25 each. Available only for MLS Regular Season matches. Click here to purchase. Now you can park, eat, and play at Hollywood Casino at Kansas Speedway! A fun and engaging atmosphere, food and beverage specials are offered in Turn2 for two hours before and after every Sporting Kansas City home match. The free garage parking keeps your vehicle safe and out of the elements while Hollywood Casino's free shuttle service offers expedited VIP transportation to and from Children's Mercy Park. From I-435 and I-70: Proceed to I-70 and exit at 110th St. Turn right onto 110th St followed by another right at the light on Village West Parkway. Turn left at Hollywood Casino Boulevard and follow signage for garage parking.